On October 11, 2017, Pasadena ISD freshmen, sophomores and juniors will take the PSAT/NMSQT (National Merit Scholarship Qualifying Test) exam. Participation in this assessment is a valuable step in the college planning process and families will receive personalized score reports that will assist in preparing for the redesigned SAT exam. PSAT scores will be available online on December 11, 2017, and students are encouraged to use the MyCollegeQuickstart program to analyze their scores, review their potential for AP courses, and explore college and career information. The National Merit® Scholarship Program is an academic competition for recognition and scholarships that began in 1955. High school students enter the National Merit Program by taking the Preliminary SAT/National Merit Scholarship Qualifying Test (PSAT/NMSQT®)—a test which serves as an initial screen of approximately 1.5 million entrants each year—and by meeting published program entry and participation requirements. 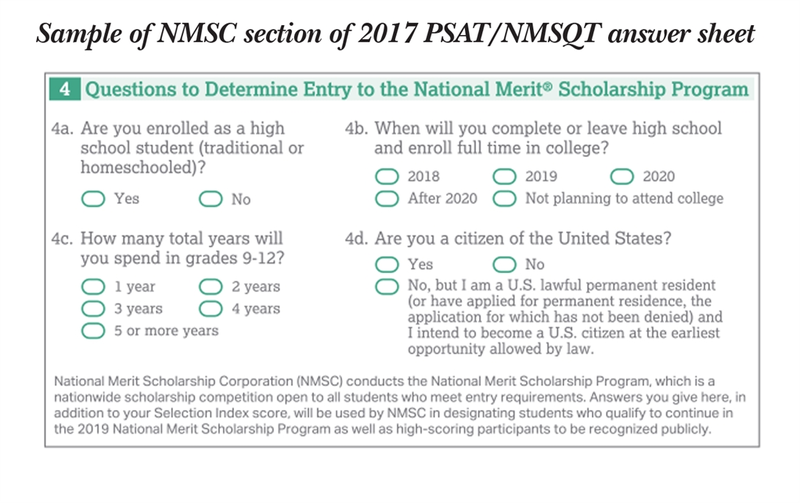 The student's responses to items on the PSAT/NMSQT answer sheet that are specific to NMSC program entry determine whether the individual meets requirements to participate in the National Merit Scholarship Program. Click here to see NMSC program entry items on the PSAT/NMSQT answer sheet. Score reports provided for test takers and their schools indicate whether the student meets program entry requirements. A school official or the student should report immediately to NMSC any error or change in reported information that may affect participation. Of the 1.5 million entrants, some 50,000 with the highest PSAT/NMSQT® Selection Index scores (calculated by doubling the sum of the Reading, Writing and Language, and Math Test scores) qualify for recognition in the National Merit® Scholarship Program. In September, these high scorers are notified through their schools that they have qualified as either a Commended Student or Semifinalist.